A godsend for when you've been burning the candle at both ends, Charlotte Tilbury's Mini Miracle Eye Wand stars a brightening eye cream and dark circle-lessening cover-up, to help your fake 'wide awake' in an instant. Five years in the making, the eye cream hydrates, smooths and 'lifts', while the concealer is enriched with light-diffusing particles to detract from under-eye shadows. We all have those days when an after-work cocktail turns into a post-midnight dance session (whoops! 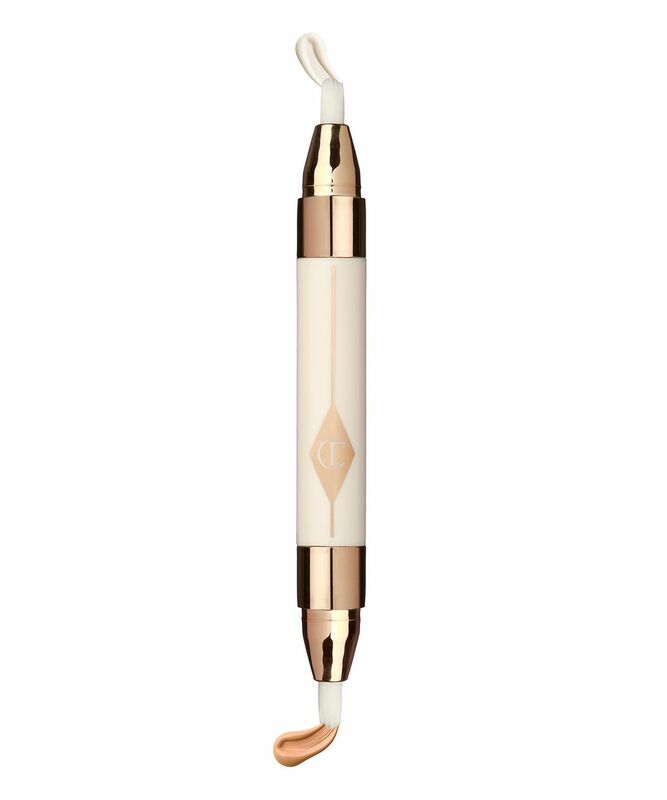 ), which is why we all need Charlotte Tilbury's Mini Miracle Eye Wand - a dual-ended dark circle eraser, that belies those tell-tale signs of late night misadventures... With a rich, line-lessening eye cream to lift, tighten and hydrate the eye area (it's brimming with hyaluronic acid and salicornia extract, alongside rice proteins to firm and de-puff bags), alongside a light-reflective camouflage to neutralise blue tones and detract from dark circles, this is the ultimate foil for too-late nights, too-early mornings (or too many cosmopolitans). Click One: Apply the hydrating and lifting Eye Cream directly from the nib onto the under-eye area and tap the product into the skin very gently. Click Two: Over your Magic Foundation or Light Wonder Foundation, use the illuminating under-eye Light Reflector to brighten the eye. Apply it directly to the under-eye, dark circles and in the socket and use the 'Tilbury Tap' to pat the product onto the skin. Illuminate Ingredients: Cyclopentasiloxane, Aqua/Water/Eau, Isotridecyl Isononanoate, Butylene Glycol, Peg/Ppg-19/19 Dimethicone, Glycerin, Mica, Dimethicone Crosspolymer, Alumina, Polymethylsilsesquioxane, Zinc Stearate, Silica, Talc, Triethoxycaprylylsilane, Steareth-20, Polyglyceryl-3 Diisostearate, Chlorhexidine Digluconate, Dimethicone, N-Hydroxysuccinimide, Tocopherol, Palmitoyl Tripeptide-1, Chrysin, Palmitoyl Tetrapeptide-7, Potassium Sorbate, Phenoxyethanol, [May Contain/Peut Contenir (+/-): Iron Oxides (CI 77491, CI 77492, CI 77499), Titanium Dioxide (CI 77891)]. Lift Ingredients: Aqua/Water/Eau, Cetearyl Alcohol, Butyrospermum Parkii (Shea) Butter Extract, Isoamyl Laurate, Propanediol, Simmondsia Chinensis (Jojoba) Seed Oil, Hydroxypropyl Cyclodextrin, Olive Oil Decyl Esters, Squalene, Borago Officinalis (Borage) Seed Oil, Cetearyl Glucoside, Cetearyl Olivate, Magnesium Aluminum Silicate, Prunus Amygdalus Dulcis (Sweet Almond) Oil, Sorbitan Olivate, Benzyl Alcohol, Glycerin, Glyceryl Caprylate, Glyceryl Undecylenate, Alcohol, Caprylic/Capric Triglyceride, Tocopherol, Anisic Acid, Hydrolyzed Rice Bran Protein, Onopordum Acanthium Flower/Leaf/Stem Extract, Fragrance (Parfum), Sodium Dehydroacetate, Xanthan Gum, Helianthus Annuus (Sunflower) Seed Oil, Sodium Hyaluronate, Sodium Phytate, Salicornia Herbacea Extract, Glycine Soja (Soybean) Protein, Oxido Reductases. Really poor product. The eye cream/serum is totally ineffective and the concealer pen is terrible quality - sinks into creases very quickly and does not provide good coverage. The eye cream seems ok, nothing too premium but a nice addition. However, the product settles into eye creases and emphasises wrinkles and I'm only 22! Would not purchase again. This is my 2nd purchase of this item. After I have finished my makeup this is the last product I use for under my eyes and it gives it so much volume - the finish touch I like to say. Totally worth it. I love CT and was intrigued to try this but after a few times using it all I can say is - I can certainly live without it. Doesn't make any difference to my routing whatsoever. The eye cream is nice enough, but the concealer side is very thin and goes straight into the wrinkles. As with any pen dispenser there are issues of the pen spouting out a tonne of product all of a sudden. I'm keeping it just for the eye cream, but if you want to cover circles/brighten up the eye area, you'd be better off with proper colour correcting routine. Initially I was looking to buy YSL Touche Eclat as I've used this in the past and the coverage is amazing. This product does not offer the same effect, I wouldn't say that it's bad but it's not what I needed or wanted. I thought I would try something different to my lifelong fav - touché eclat. A mistake I will never be making again, the eye cream doesn’t make a difference to me whatsoever and I didn’t like the tone or texture of the actual concealer, it had no brightening effect on me at all. After 2 days I have returned back to my trusty old ysl friend. Never to be swayed again. I wasn't expecting much from this pen. You get an eye cream on one end and a concealer on the other. I was fairly surprised how I keep reaching out for this pen whenever I do my makeup and I have tried so many types of concealers out there! I love the eye cream, it made my undereye bags moisturised and glowy. The concealer reminds me a bit of the YSL Touche Eclat; same consistency, pigmentation and longevity. Do wear the cream with the concealer because I feel like they work so well together. I tried the concealer alone and it felt a bit dry on the skin. This is a very good product, I recommend. I do enjoy using this product (have the lightest shade). The eye cream is very hydrating and luminising. Then when you add the 'light reflector' side, it gives you this nice light coverage and great lift and highlight. It is not a concealer (the retoucher is the concealer and it's a separate product) but I do enjoy this product as it's very natural and does a great job of reflecting the light and making the eye area look fresh and bright.